In 2012, the Cumulative Impact Monitoring Program (CIMP) with various academic, government and community partners, including the Sahtu Renewable Resources Board, proposed a five year project to study the aquatic health in the area where intensive oil and gas exploration is taking place. Although there are many proposed and active developments west of the Mackenzie River, between Tulita and Norman Wells, there currently is very little information on the health of aquatic systems in the area. A baseline water quality and stream health assessment program was designed with input from academics, communities (Tulita and Norman Wells) and regulators (SLWB). Undisturbed and disturbed streams (i.e., streams located downstream from winter roads, all weather roads, well pads, seismic lines, camps, quarries, drilling activities) are being sampled for water quality as well as benthic macroinvertebrate abundance and diversity to determine baseline conditions throughout the watersheds and streams of key interest. The long-range atmospheric transport of mercury and subsequent deposition in Arctic environments is an ongoing global concern. In November 2013, after years of negotiations, a legally binding international treaty, the Minamata Accord, to reduce harmful emissions of mercury was signed by more than 140 nations. In the NWT, and in particular in the Sahtú Region, community concern about the potential negative impacts of mercury contamination in fish, public health advisories for local lakes (e.g., Kelly Lake), and associated human health risks remains a priority. 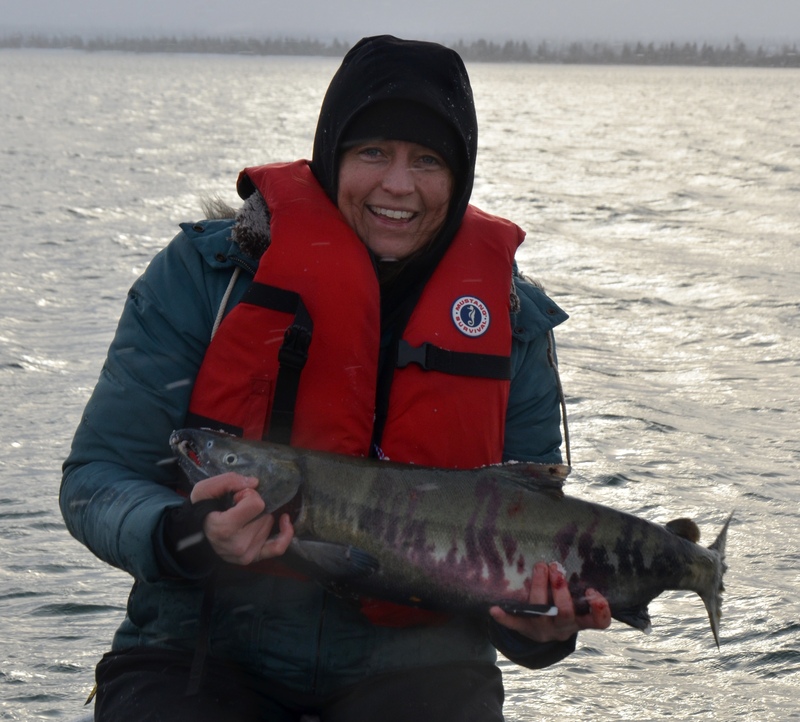 As a result, the proposed research will help Sahtú communities to better understand the relevance and findings of mercury studies that have been undertaken. The need for a compilation, analysis and synthesis of research on mercury in the Sahtú, and reporting back to front-line workers and community representatives, became apparent at the Tulı́t’a Research Results Workshop in November 2013, when numerous concerns were raised. The proposed project will accomplish the following: 1) desktop review and synthesis of mercury research data for the Sahtú region, 2) compare research findings with guidelines and advisories to determine where concerns may exist, and 3) summarise findings of Sahtú mercury research and identify any gaps (research and communications). Working through the ɁehdzoGot’ı̨nę Gots’ę́ Nákedı and the Sahtú Environmental Research and Monitoring Working Group, the proposed research project will emphasize the synthesis of existing data for the priority contaminant mercury. The work will be a desktop study, with guidance and feedback provided by the Sahtú Environmental Research and Monitoring Working Group. Work will be carried out between July and October 2014, with reporting and a community summary of findings to be prepared by mid-December 2014. The purpose of this gathering was to engage in dialogue with elders about wildlife management, research and monitoring. Environmental DNA, or eDNA, is the DNA of the things that live in the environment. Through this project, we are developing eDNA as a tool to assess the presence of specific fish species without actually seeing the fish themselves. While eDNA techniques have obvious applications to fisheries management and conservation issues, including assessing current and potentially shifting distributions and habitat use in the vast and rapidly changing Arctic, protocols specific to northern environments remain to be developed and validated against traditional sampling methods in remote locations. 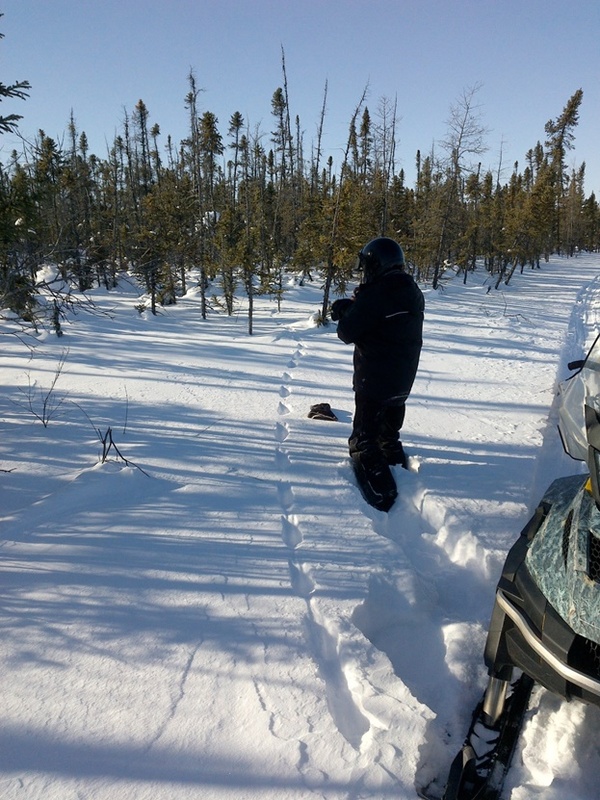 Therefore, for this project, we are focused specifically on developing protocols to detect rare and cryptic species in remote northern watersheds using a community-based monitoring approach. 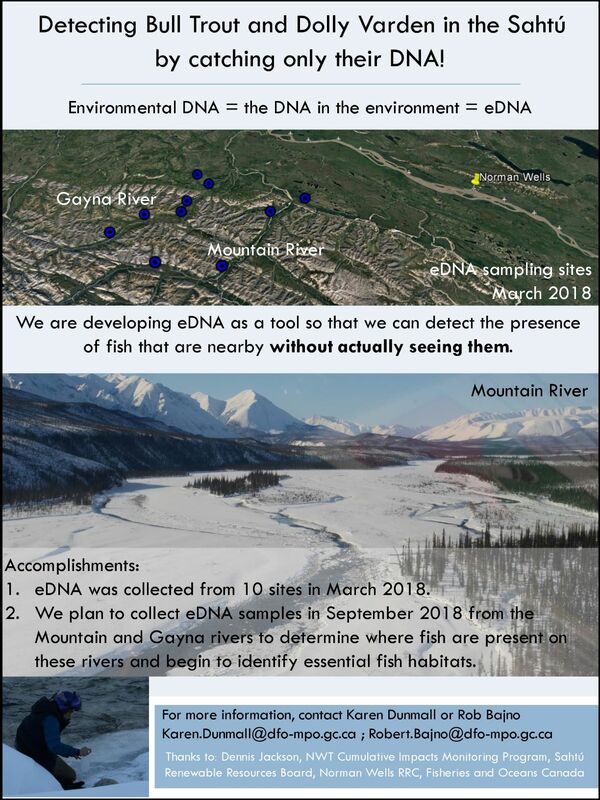 We are looking specifically for the DNA from Dolly Varden, bull trout, pink salmon and chum salmon in smaller rivers in the Gwich’in Settlement Area, and in the Mackenzie River in the GSH and Sahtú. 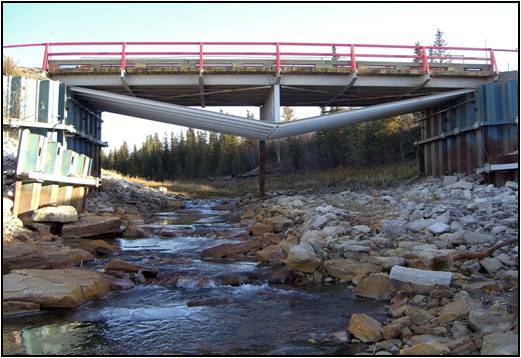 Between 2007 and 2010, a monitoring project of Bosworth Creek was sponsored by the Ɂehdzo Got’ı̨nę Gotsę́ Nákedı, with funding from the NWT Cumulative Impact Monitoring Program (CIMP) along with other partners. As part of this project, students at Mackenzie Mountain School were engaged to monitor aquatic ecosystem health. Sampling and analysis of bird populations, soil and water chemistry, fisheries, fish habitat, benthic invertebrates, amphibians, and creek habitat were conducted. Community monitors and researchers were trained, and Mackenzie Mountain School students learned a wide range of scientific applications. The Ɂehdzo Got’ı̨nę Gotsę́ Nákedı developed capacity to monitor impacts and account for natural and man-made changes to watersheds. This information was considered in the Mackenzie Gas Project cumulative effects hearings. Bosworth Creek originates at Hodgson (Jackfish) Lake (65° 18’N 126 41’W), Tulita District, Sahtu Settlement Area and parallels the base of Discovery Ridge before changing course and joining the Mackenzie River within the municipal boundaries of the Town of Norman Wells. The creek exhibits a variety of habitats along its course and has played an important role in local history. Natural flow was impeded with the construction of a weir in 1960 approximately 250 metres from its convergence with the Mackenzie River. The pond created behind this weir supplied both the oil refinery for their steam plant and the Town of Norman Wells with drinking water. 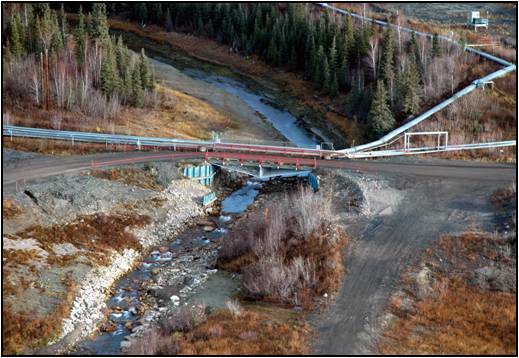 The town abandoned this water source in 1991 and closure of the refinery in 1996 prompted channel flow reclamation as recommended by the Government of the Northwest Territories (GNWT). 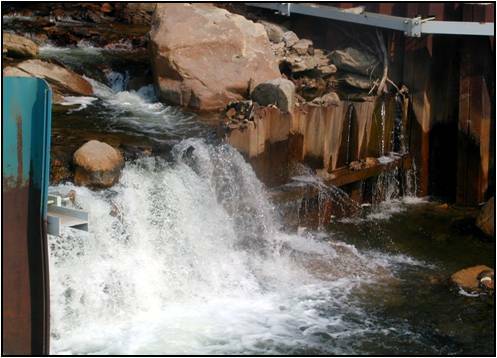 The weir was removed and natural flow restored in 2005 under Imperial Oil Resources NWT Limited’s (IORL) Reclamation and Restoration Plan. 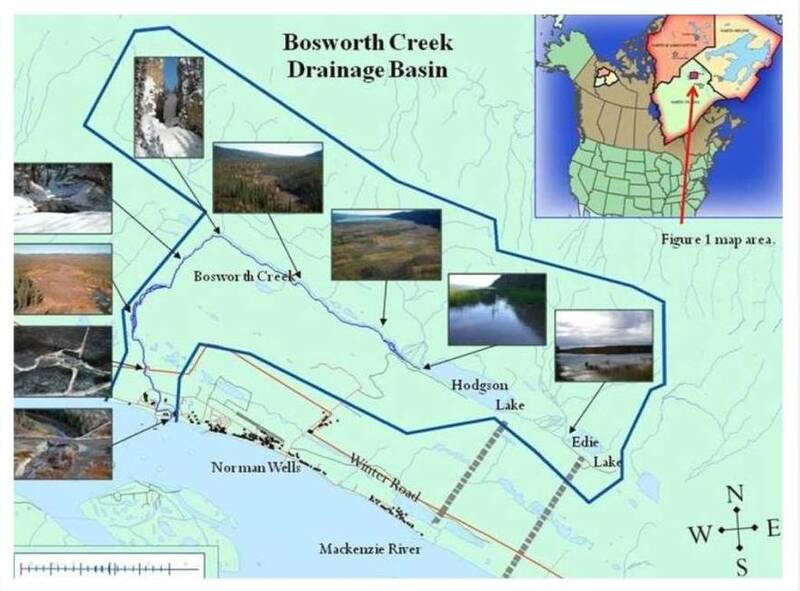 The Bosworth Creek Monitoring Project was developed following questions raised by local residents regarding the absence of whitefish and other aquatic species. The general question was “Now that the barrier has been removed, will these animals re-inhabit the stream on their own or should they be re-introduced?” The SahtuRenewable Resources Board (SRRB) contacted the Department of Fisheries and Oceans (DFO) and discussed possible avenues of mitigation. It was concluded that re-stocking the creek was unnecessary due to the weir’s removal and that natural introductions should occur following stream reorganization. The recent restoration of Bosworth Creek presents a unique opportunity for local youth and residents to monitor aquatic ecosystem health. This monitoring project enables students and others to learn about local fish, invertebrates, hydrodynamics, sedimentology, streambed morphology, sampling techniques, data collection and evaluation. Students from Mackenzie Mountain School learn a wide range of scientific applications and report their findings to the scientific community through public presentations, science fair projects and publications. 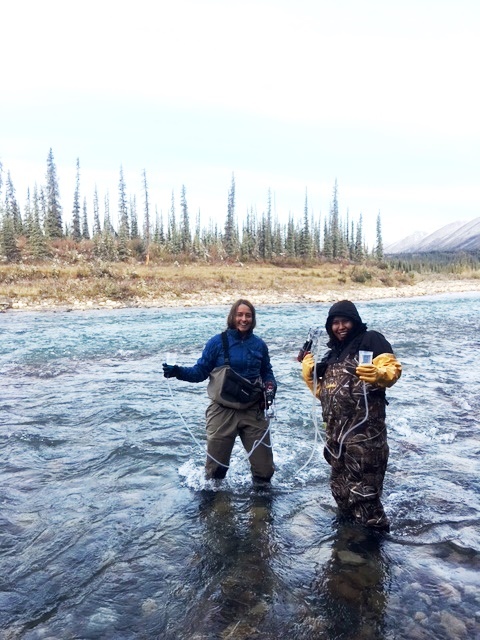 The Sahtú Wildlife Cumulative Effects Monitoring Workshop took place over 2.5 days on September 2-4, 2014 in the K’ásho Got’ı̨ne Community Hall, Fort Good Hope. The workshop was an opportunity to continue a discussion of options for the development of collaborative cumulative effects monitoring programs to address the current and potential future increase in development on wildlife and wildlife habitat in the Sahtú. The purpose of the workshop was to: Develop a prioritized list of wildlife monitoring questions; and build consensus on preferred methods used to address each question.